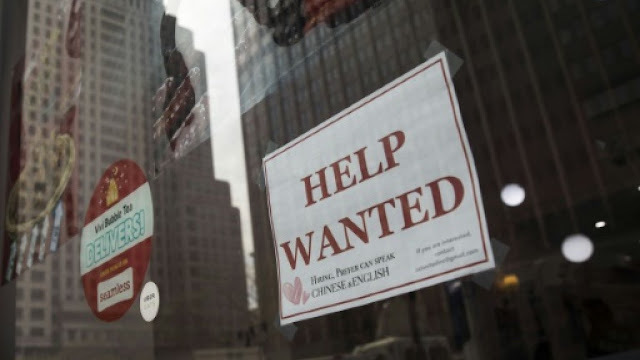 Hiring in the US private sector slowed for the second month in a row in March, hitting its slowest pace in 18 months, survey data showed Wednesday. The monthly data from payrolls firm ADP comes two days before the more closely watched government report on employment but the two are frequently out of step. Private-sector employment increased by 129,000 jobs for the month, much lower than the 178,000 economists had been expecting and less than half the result posted in January, according to ADP. "The job market is weakening, with employment gains slowing significantly across most industries and company sizes," Mark Zandi, chief economist at Moody's Analytics, which jointly produces the report, said in a statement. "Businesses are hiring cautiously as the economy is struggling with fading fiscal stimulus, the trade uncertainty, and the lagged impact of Fed tightening. If employment growth weakens much further, unemployment will begin to rise." Job losses were recorded in the construction and manufacturing sectors as well as in financial activities, according to the survey. Small businesses with fewer than 20 employees also weakened, shedding 9,000 jobs. But strong hiring continued in education and health services, which together added 56,000 net new positions. The Labor Department is due to release its latest monthly employment report on Friday. The prior report for February also showed a sudden weakening in hiring that fell far below the numbers reported by ADP. The consensus among economists calls for Friday's jobs numbers to show private-sector hiring of 160,000 new jobs. Despite low unemployment, the Federal Reserve has signaled it will pause last year's cycle of interest rate increases amid signs the economy is slowing.